The great cities of Europe are often known for what goes on below their streets as above—the London Underground, the vaults of Edinburgh, the catacombs of Paris. 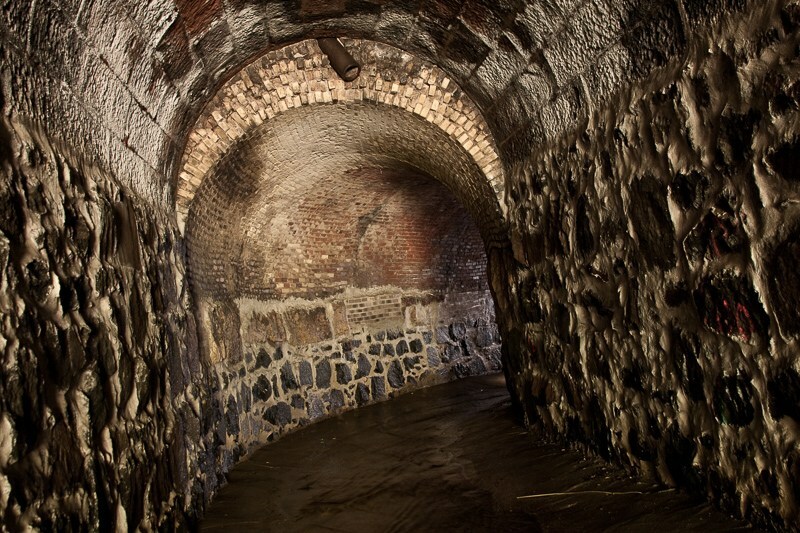 Duluth has its own subterranean features, though they are much less on the minds of its people. Many of Duluth’s downtown buildings are connected below street level, and a series of tunnels bring I-35 through Duluth to its final destination at 26th Avenue East. 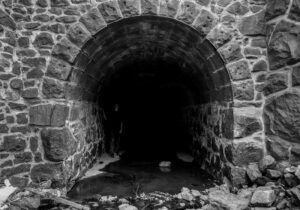 Duluth has planned and built tunnels for various projects dating back almost to its inception, and the first one was expected to make its owners, and the blooming city around it, rich beyond their dreams. After gold prospectors accidentally stumbled across traces of silver in the stones of the Point of Rocks in 1870, local industrialists dreamed of finding riches below the Zenith City. On December 10th, 1883, seven men—including former Duluth Mayor Clinton Markell and Michael Fink, owner of the Lake Superior Brewery—launched a plan to do just that when they organized the Duluth Silver and Copper Mining Company. They began their dirty work just 10 days later. By March of 1884, their work had extended below Piedmont Avenue (Mesaba Avenue today; Duluth once had two Piedmont Avenues), about 150 feet from where they had begun, thanks to their steam-powered drill and five fortune-hungry laborers. 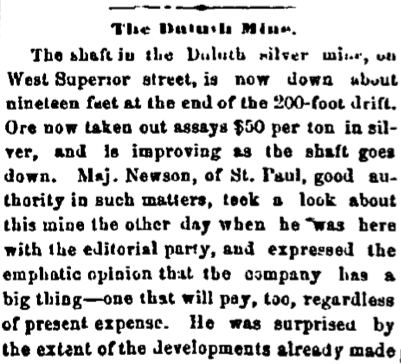 For better or worse, the Duluth Silver & Copper Mining Company never located a profitable vein west of downtown. By June of 1885, all mining operations had ceased below the Zenith City. What was left above ground of the mine was pushed into the mouth of the 200-foot hole and abandoned. 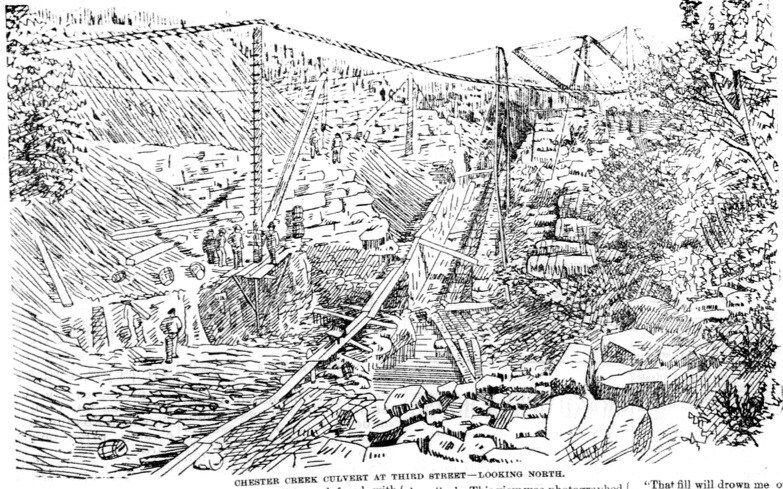 A few years later, the city built the first mule corals for the Duluth Street Railway Company on the site of the mine. Later, the Bridgeman-Russell Creamery was located on the spot. 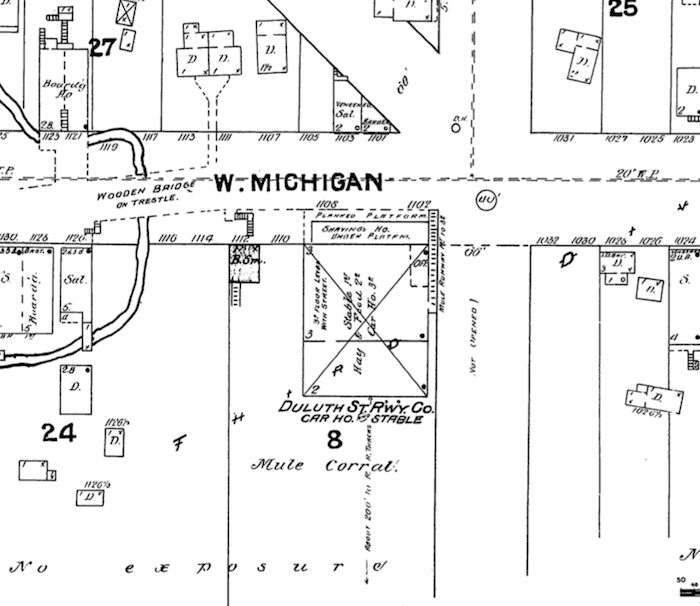 Today, the mouth of the silver mine is almost exactly below the street sign on West Superior Street that indicates the Superior Street/Mesaba Avenue split, looking eastbound. Construction of I-35 has left a considerable mound of dirt against the lower section of the Point of Rocks where Duluthians of the past sought silver, but the mine shaft no doubt still exists in some form, just out of sight. Duluthians have seen it before, even if they have never noticed it. Every map of Duluth shows a plethora of streams and creeks flowing down the hill when, suddenly, each disappears into a street name: the sign of the culvert. The Zenith City contains more than twenty creeks determined to find their way to Lake Superior, and each passes through a specialized tunnel somewhere along its path. As the city expanded, so did the need for land; packaging the streams in concrete and stone and burying them was one simple way to create more developable property and in most cases eliminated the need for bridges. 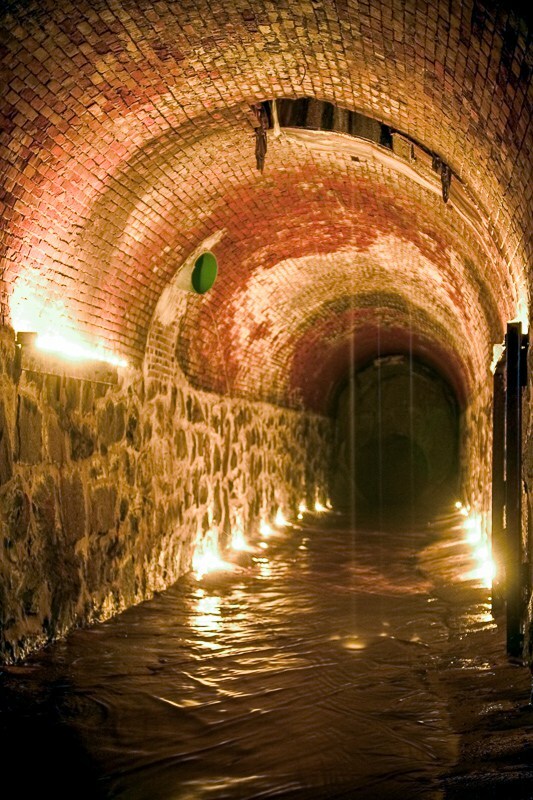 The subterranean diversion of three creeks in particular, Chester, Brewery and Clark House, has made a dramatic impact on Duluth’s development. The little river that is the highlight and namesake of Chester Creek Park is as powerful as it is beautiful, and it spends much of its time south of the park underground, below streets, homes, and the historic 1915 Duluth National Guard Armory. 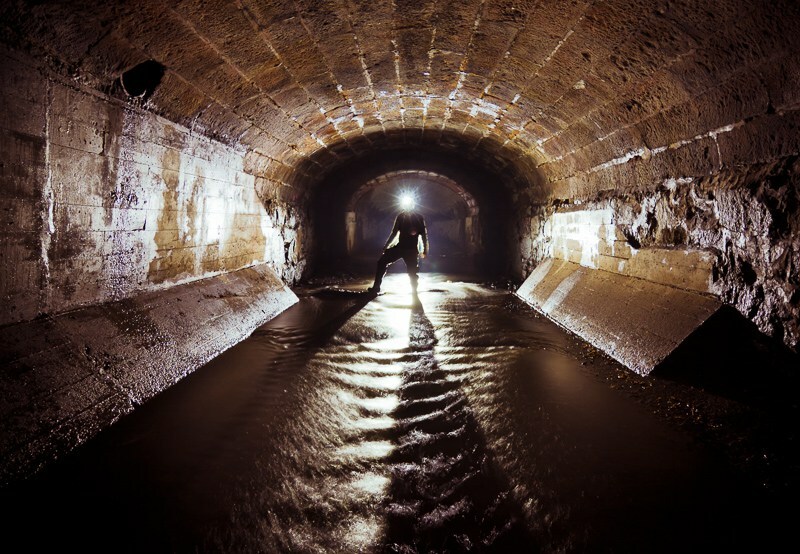 In fact, nowadays the creek is probably best known for the day when floodwaters caused the roof of the tunnel to rupture, exposing the basement of the long-vacant landmark. After that point, for more than a year, the basement of the Armory was visible from the canal below it, and both could be seen from London Road, through the hole varied by the flooded creek. Duluth was still young when city planners realized the need to contain Chester’s power. 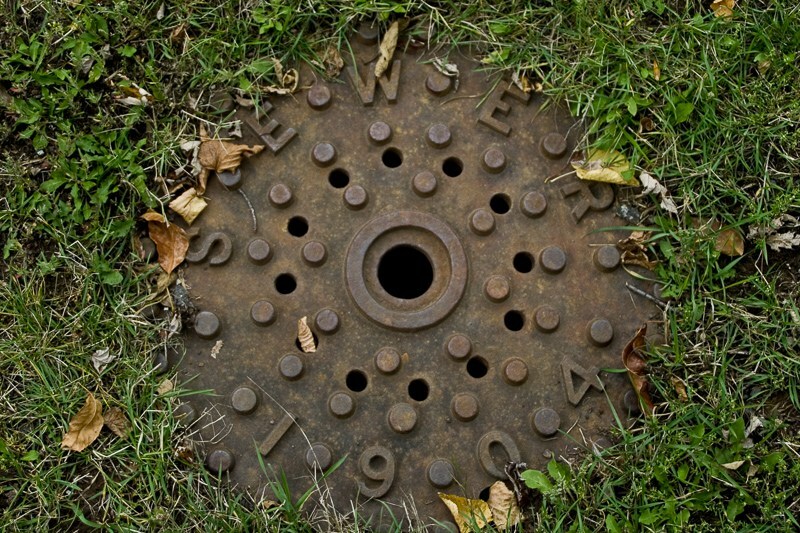 In late 1887, when the city had only constructed a few humble drains between 7th Avenue West and 2nd Avenue East, a project between 13th and 14th Avenues East became a major undertaking. That year, the city contracted local stonemasonry firm Fredin & Wilson to contain Chester creek through a series of retaining walls and a culvert beginning at 4th Street. The masonry retaining walls were planned to be 40 feet high and restrict the creek bed’s width to about 18 feet. Though strictly functional, it was hailed as one of the most beautiful pieces of masonry in the city when it was completed in late November. The culvert at the end of the retaining walls stretched 150 feet and sat about 45 feet below the surface at its deepest point. All of the work was done in stone. Lower sections followed. 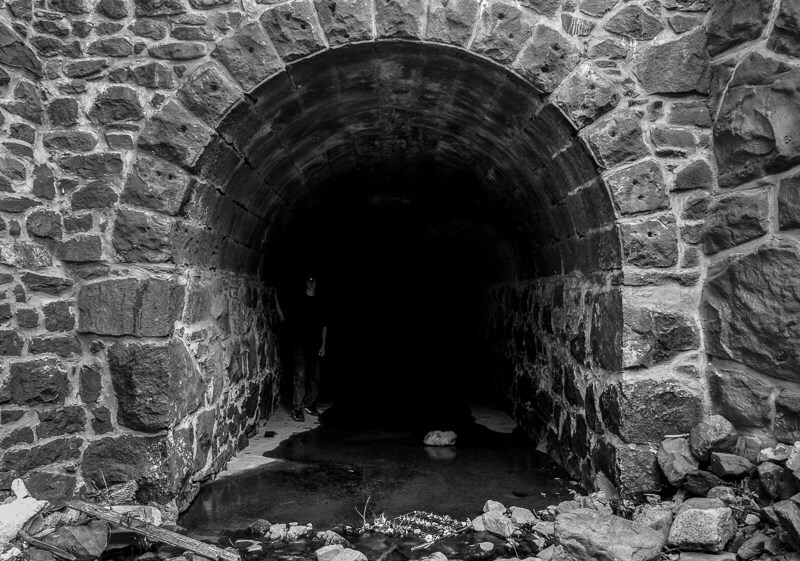 A tunnel crossing at 1st Street was added in 1917 to replace a dilapidated bridge the News Tribune described as “an old and troublesome problem of the city of Duluth.” A few years prior, in 1910, a culvert was constructed below Superior Street to act as the final leg for the runoff to flow into Lake Superior, but the construction of the Duluth Armory in 1915 necessitated the extension of that tunnel below London Road. 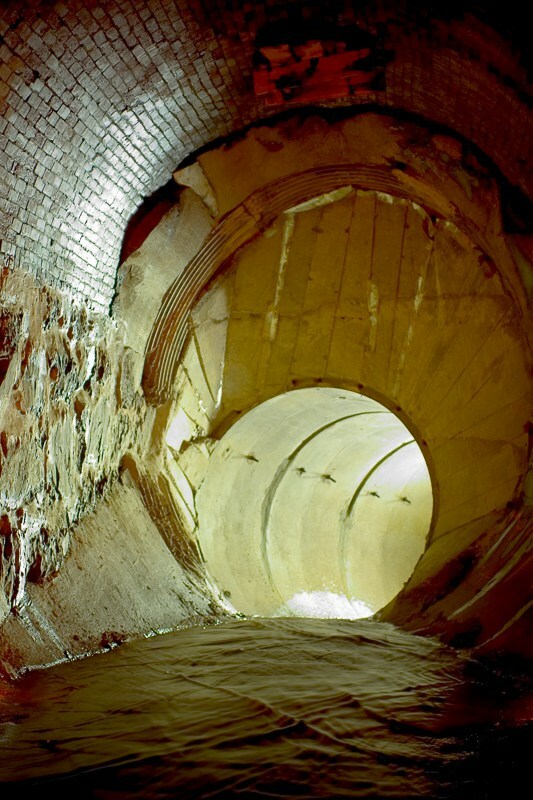 Today these visions and revisions are evident in the tunnel’s many changes in shape, direction, and building materials. At the mouth below Superior Street, the tunnel is that of a stone bridge built over the creek in 1919, which gives way to red brick and concrete, then to yellow brick. Each of the layers in what is now a 700-foot long tunnel tells a story of expansion above ground, if you know how to read them. Chester Creek Drain empties into a little-known grotto, just north of the Rose Garden. To find it, simply take the Lakewalk below the Rose Garden and find the former railroad bridge which the trail crosses now. There is a path to go through the arch below.